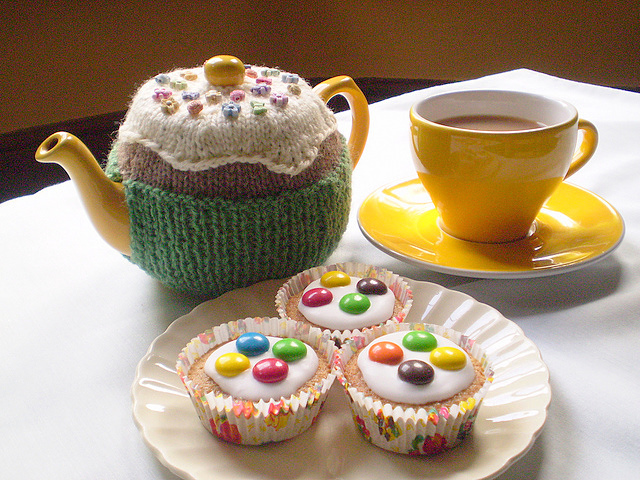 Tea, Cake and Knitted Tea Cosies! If you’re anything like me and looking for fun gift ideas to knit for Christmas, we reckon this will be a good one. You can download the knitting pattern pdf for free, though Frankie has asked people to consider making a donation to her chosen charity, Children’s Liver Disease Foundation, at her Just Giving Page. Frankie has loads more super cute free patterns on her Ravelry, for some really cool bags, blankets, knitted pots, toy knitting patterns and really useful stuff you wouldn’t necessarily think of making! She has also been featured in the knitting books Tea Cozies, Tea Cozies 2 and Coffee Cozies, published by Guild of Master Craftsman. Cosy Tea is now on Ravelry! Join the Tea Cosy Corner group to chat about our patterns and swap notes! All patterns we have featured are to be used for personal use only. Please respect the designers and do not use products made from these patterns to sell or profit from. Viva! All Cosy Teas are certified for vegan diets by Viva!